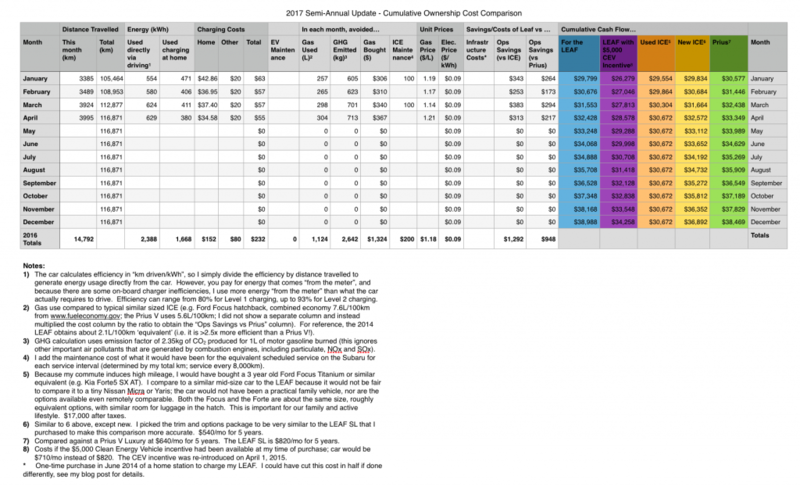 Time for another electric vehicle (EV) total cost of ownership (TCO) update for my 2014 Nissan Leaf SL. This is the seventh in a series – the earlier posts can be found at the “Cost Info Posts” page. I’ve now crossed over 122,500 km at this time of writing, of which I had hit about 117,000 km at the 3 year mark 7 weeks ago. Skip towards the end of the post for some snippets of items I found interesting in the EV world in the past 6 months – if you want more details on cost breakdown, keep reading from here. 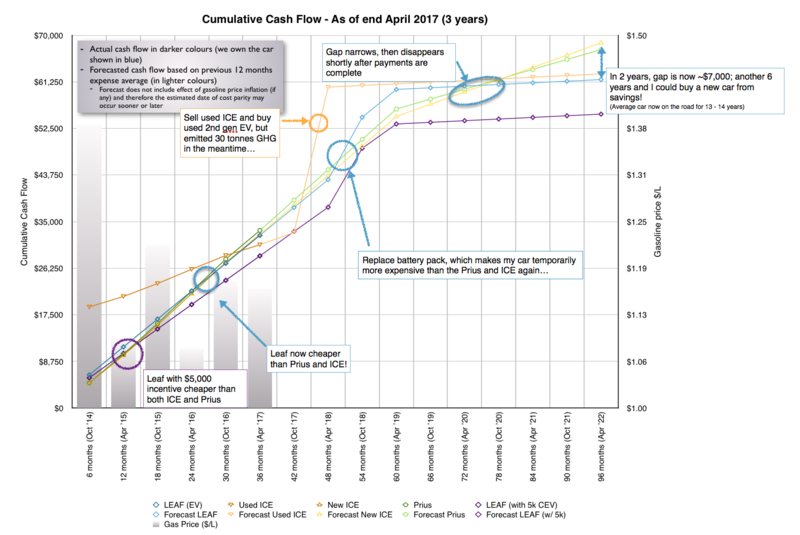 Steady as it goes – the savings over a conventional ICE or Prius continue to mount, though at a slower rate in the last 6 months than the previous one, because the regular maintenance intervals for the gasmobiles were cheaper this period. That will change in the next 6 month interval and the LEAF will stretch out its lead further. Read the first post in this series for an explanation on the comparisons I’ve made. Eagle-eye regular viewers will note that the spread is a bit higher in this version of the chart then the previous update – that is a limitation of my “basic” forecasting spreadsheet which only looks at the previous 6 months of costs, and during the 2 yr to 2.5 yr period, there was a few fairly expensive regular maintenance visits for the gasser vs what would have occurred during the 2.5 yr to 3 yr period. Sorry, I haven’t bothered to fix this wrinkle, but using a crystal ball for the future is always subject to error bounds of some kind! Battery replacement I’ve still left as sometime after 4 years of ownership. At that point, I’ll be over 160,000 km, and as you can see, the cost will temporarily put the LEAF more expensive on a cumulative basis “to-date”, but the odds are in the LEAF’s favour for long term lower TCO. “In my last cost update, I relayed how I had started checking my battery capacity with a phone app and an OBDII interface. I’ve continued to collect data over the intervening year, and I’ve since moved my expected battery refit back a year. Really though, that would likely be based out of ease of convenience, I’ll still be able to get to work with a battery at 75% capacity, which I likely won’t see until after owning the car for several years. 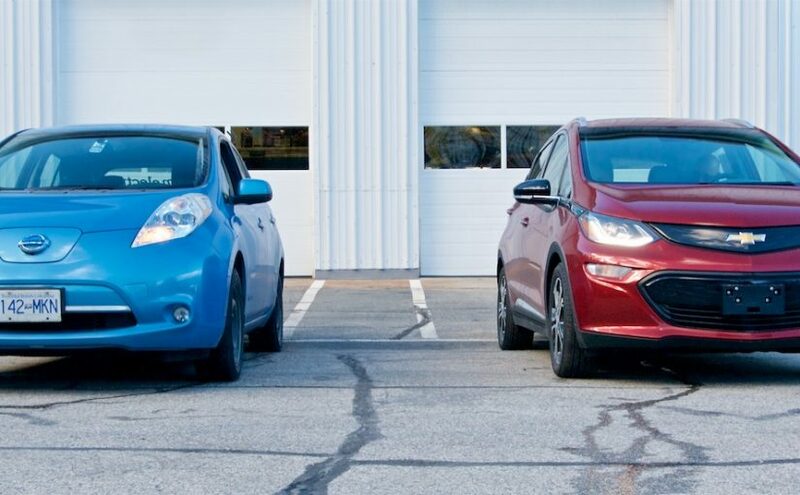 By that time we’ll have replaced the Forester with a long-range EV (like a Tesla Model Y), and the Leaf will only have town duty. I doubt we’ll ever replace the battery on it. Above comments still stand – and of course if you used an incentive that is available in BC, ON or QC, you’d be ahead already! My boys and I spent most of a day with a film crew with our LEAF as the main “actor” for a video spot to launch an info campaign for the Accelerate Kootenays project, which will put 40 Level 2 chargers around the East and West Kootenays, plus an additional 13 DC fast charger units! The first was operational in early April in Cranbrook, and a few more should be installed by end of 2017, with the remainder installed in 2018. Nelson picked up 4 new Level 2 chargers this period, so I’m no longer the only public charger in town haha 🙂 Come visit! On that note, I also posted a nice video of a lovely circle tour from Nelson – check it out, then come here and do it yourself! In March, I was able to test drive a brand-new Chevrolet Bolt – great car! If I didn’t already own a Leaf (which covers the daily commute), I’d be seriously considering one. But, Nissan isn’t far behind with offering a new long-range car; the next version will be announced in September 2017! There are confirmed BEV CUVs coming in 2018! Hyundai has announced one, and so has sister company Kia. Turns out I was right, the state of health (SOH) is varying with ambient temperature. 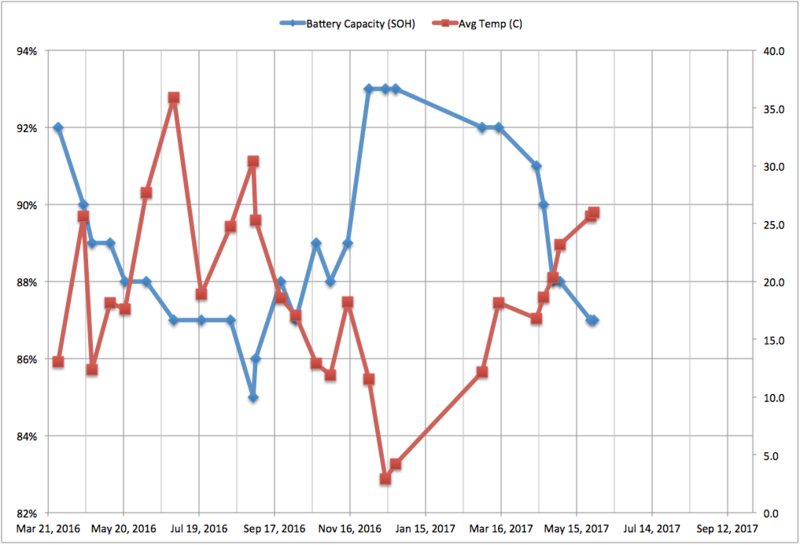 So during the winter, it appears that the battery is regaining “health”, but by spring it is almost back to where it left off the previous fall. I’ll probably lose my first “capacity bar” sometime in 2017. Another thing that affects LEAF Spy stats is simply the level of activity. My 2016 LEAF had perfect stats thru-out the entire (very long) Summer season this year but showed signs of dropping when the weather turned cold a few weeks ago. But temperatures didn’t play a part as work slow downs and just trying to reduce the mileage (Tomorrow is my one year anniversary and I have over 26,000 miles) a bit. A brief 4 day splurge in work brought my stats back up to new levels again.